Burj Khalifa known as Burj Dubai before its inauguration, is a megatall skyscraper in Dubai, United Arab Emirates. Burj Khalifa is the tallest building in the world with an architectural height of 2716.5 feet or 828.0 meters. Its occupied height (height of the floor occupied by people) is 1918 feet or 584.5 meters. Its total height measured from its tip is 2723 feet or 829.8 meters. Not just the tallest building, the Burj’s height surpassed anything ever built by man from the ground up. The observatory deck of the building is located at a height of 1483 feet or 452.1 meters. There are 163 floors located above the ground and it has only one floor located below the ground. It has 58 functional elevators that run at a top speed of 10 meters per second. Burj Khalifa boast 2957 parking spaces, 304 hotels and 900 apartments. The Gross Floor Area of the tower is 3,331,140 ft2 or 309,473 m2. The Gross Floor Area is the area within the footprint of the tower and does not include connected buildings and adjoining podiums. The developer/owner of the tower is Emaar and its design architect is Skidmore Owings & Merill and architect of record is Hyder Consulting. MEP (mechanical, electrical and plumbing) engineer as well as structural engineer is Skidmore Owings & Merill. Turner Construction was the project manager for Burj Khalifa while Besix, Arabtec and Samsung C&T Corporation were its main contractors. Dow Corning Corporation supplied sealants for the tower while Otis Elevator Company supplied the elevators. Located in Dubai, United Arab Emirates, this tower was initially named as Burj Dubai. The building was proposed in 2003 but construction work started in 2004 and was completed in 2010. The lobby of The Residence at Burj Khalifa is dominated by artist Jaume Plensa’s eponymous sculpture ‘World Voices‘. The piece incorporates 196 cymbals. Water dropping gently from the ceiling strikes the cymbals and creates a chorus of distinct tones that represent the voices of people worldwide. Burj Khalifa is the tallest tower in Dubai, UAE, Middle East and World. It is 3 times as tall as Eiffel Tower and two times taller than Empire State Building. The tower also holds world records for: ‘tallest free standing building’, ‘highest occupied floor’, ‘highest number of stories’, ‘longest travel distance elevators’, ‘tallest service elevator’ and ‘second highest outdoor observatory deck’. Record for highest outdoor observation deck is now held by Canton Tower which was officially opened in December 2011. Total aluminum used in the tower weighs as much as 5 A380 aircraft. Total concrete used in the tower weighs as much as 100,000 elephants. During peak construction days, 12,000 workers were engaged every day. Construction of Burj Khalifa began in 2004, with the exterior completed in 2009. The primary structure is reinforced concrete. The building opened in 2010, as part of the new development called Downtown Dubai. ’22 million man-hours’, ‘55,000-ton steel rebar’ and ‘110,000-ton concrete’ were used to complete the construction of the tower in 6 years. Skidmore Owings & Merill is an American architect firm and they developed the structural system called ‘buttressed core’ that supports 163 floors of the building. So much rebar was used in the construction of Burj Khalifa that if they were laid down end-to-end, the total length would be one-quarter of the total way across the globe. Burj Khalifa’s three primary entrances – Armani Hotel, Residence and Corporate Suites – were designed to be on different levels to ensure smooth-flowing traffic at all times. 26,000 glass panels cut individually were used to create the exterior of the building. 300 Chinese cladding experts worked together to design a cladding system for the tower that could withstand Dubai’s summer heat. Burj Khalifa requires a supply of 250,000 gallons of water each day and total electricity consumption of the building is equivalent to the electricity consumed by 360,000 bulbs of 100-watt each burning at the same time. The building has a specially designed elevator system for controlled evacuation during emergency situations like security threats or fire. The building has 12 machines of 13 tons each moving along tracks constructed outside the building. 36 cleaners board these machines to clean the 24,000 reflective windows of the tower. The design of the tower is inspired by the shape of Hymenocallis flower. The flower is known for its long petals extending out from its center. The interiors of The Residence at Burj Khalifa are inspired by Middle Eastern culture. Curves and arcs that are representative of the strokes in Arabic calligraphy as well as the slopes of sand dunes can be seen in the flooring, carpets and ceilings. All heights are measured from the lowest level of open air, significant, pedestrian entrance. Underground floors are not included in the measurement. 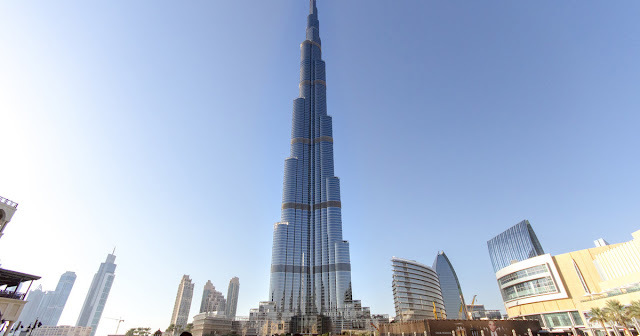 The total cost of building Burj Khalifa was $1.5 billion. The Burj Khalifa’s design embodies the lyrical and well-proportioned structure of the Hymenocallis or Spider Lily, a regional desert flower that inspired architect Adrian Smith’s vision of the iconic tower.